It's been tough for me to knuckle down and actually finish Red Dead Redemption 2's story. 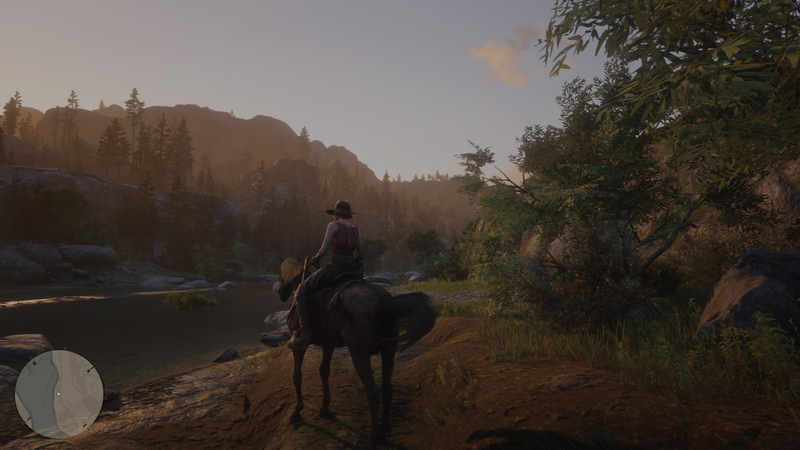 Despite having more money than I could ever spend, I still find myself blowing up stagecoaches, chasing after legendary animals, and taking on the seemingly endless number of side missions. It's all so much fun that I just don't want to stop. But that enjoyment has been tempered with the gnawing feeling that it's all kind of pointless. Fun as it is to take down a heavily guard coach or knock off a train, the practical reward is almost nil. I do it anyway, though, because Red Dead Redemption 2's open world is its own reward. That brings me to Red Dead Online, which I'm already enjoying quite a bit. The new online mode, which launched its beta for a limited number of players yesterday, is everything I like about the core game, but with the ability to roll my own character and team up with friends. Even better, I actually have reason to earn money now, as I'm once again a dirt poor criminal with a broken down nag and $20 dollars to my name. Superficially, it's not so different from the core game. It begins with your character being booked into prison, complete with mugshot, before being rescued from a chain gang. Soon after, you are are given a camp, a horse, and a gun. The possibilities are laid out in quick succession: you can take on side missions for a bit of cash; steal horses and turn them in for money, attempt some more elaborate train heists with friends, or simply go hunting. I've opted to spend most of my time on the last option, chasing bucks through the woods near Strawberry and pigs through the fields of Caliga Hall. There's no Trapper with unique outfits—at least that I can see—but perfect pelts are still a pretty valuable commodity. And with no Stagecoach Fence available, they might be the most reliable way to make money short of taking on missions or going on heists. The familiar flow of hunting and exploration has made it easy for me to acclimate to Red Dead Online. The world feels strangely quiet, with only the occasional player riding past on the road. Most players seem content to hang in and around Blackwater, which has become a kind of impromptu PvP server as they engage in a neverending shootout. It's here that Red Dead Online feels most similar to its obscenely successful sibling, GTA Online, albeit without jets to hijack in midair. Red Dead Online is full of chill moments like these. Having been shot dead twice in Blackwater, I've mostly stayed well away from Red Dead Redemption 2's forbidden city. But even without other players, there's a fair amount to do in Red Dead Online. 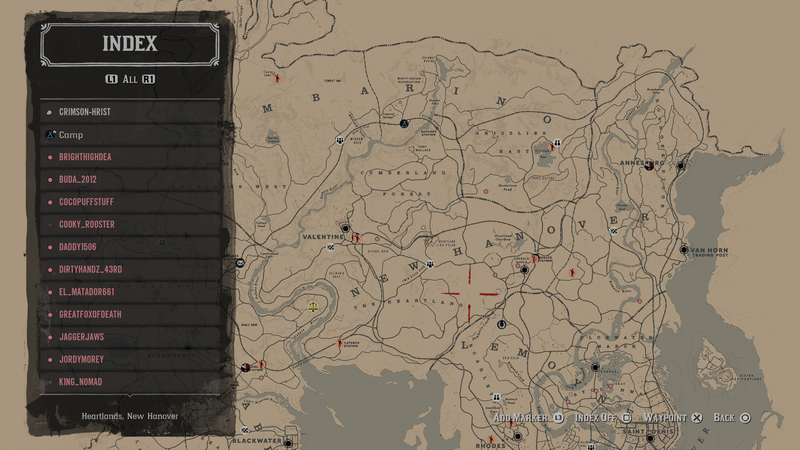 Map markers denote races, multiplayer matches, and story missions (yes, Red Dead Online seems to have a story, though it's unclear how extensive it is). You can see a train chugging along to the north, providing a tempting target for would-be bandits. If you go into the "Online" portion of the menu, you'll find a handful of additional modes. You can select a particular region for free roaming; you can "Posse Up" with friends, or you can play Showdown, which includes the mode billed as Red Dead Redemption 2's take on battle royale. Thus far, at least, Showdown is by far the weakest aspect of Red Dead Online. It includes a handful of random modes, from the familiar Team Deathmatch to Name Your Weapon, where points are awarded based on which weapon you use. The battle royale mode, called "Make it Count," restricts players to bows and knives, making for a novel but also somewhat shallow battle royale experience. To be honest, Red Dead Redemption's gunplay has never really been its strong suit. It works with the core games elaborate setpieces, which are defined by chaos, but RDR 2's clunky controllers offer little in the way of precision. It's typically best to just use the extremely generous auto-aim, which isn't the best fit for skill-based competitive multiplayer. Red Dead Online's map generally has plenty to offer. Thankfully, these modes are easily ignored. The real pleasure of Red Dead Online seems to be in riding out with friends into a world ripe for the taking. Bank heists, which are relegated to story missions in the main game, are purportedly possible in Red Dead Online. Train robberies are far more enticing with a large crew to handle the passengers, the guards, and the safe. I enjoyed many of these same activities in the core story mode, but they feel far more relevant in the online game, where money is at a premium. All the sudden it doesn't feel like a total waste of time to grab an extra pelt or loot a bandit. The little distractions that have long since become mundane feel fresh again, if slightly more limited (I'd love to be able to sell stagecoaches, but that would probably break the in-game economy). For now, Red Dead Online feels relatively quiet, as its population is still limited to those who purchased the Ultimate Edition. The rest of the playerbase will gain access on November 30, at which point I expect the neverending gunfight to expand well beyond the bounds of Blackwater. But even when that happens, it will still be possible to get lost in the woods hunting bears, or along the silent country roads with friends. And more than anything, I expect that will keep me playing Red Dead Redemption 2 for a long time to come. Tagged with Opinions,	PlayStation 4,	Red Dead Online,	Rockstar Games,	Xbox One.